Arrive Beijing, meet and transfer to your hotel. Have a ride on a two seat pedicab/trishaw with someone peddling you through the charming Hutong lanes of quickly disappearing old Beijing. Visit with a local family residing in a typical quadrangle home, local market and drum tower. Dinner is on your own. Today, climb the truly awesome Great Wall of China (UNESCO World Heritage site). Visit the Badaling section. All portions ever made would equal a solid defense wall going around the equator one and one-half times. At the less visited Badaling section, one of the most impressive portions of the barrier, you have time to enjoy the area, photograph majestic views and maybe bargain with the local vendors. Visit Beijing Jade Carving Factory followed by lunch at its Friendship Restaurant. This afternoon, visit the Summer Palace, which is the best-kept existing royal garden in Beijing, a complex of pavilions, temples, and galleries set among beautifully landscaped grounds, situated on Kunming Lake (subject the weather permitting). Peking Duck Dinner at local restaurant. Visit the vast Temple of Heaven complex (Tiantan Park, a UNESCO site) that was once a sacred area used only by the emperors of China for important ceremonies to honor Heaven, the supreme power. The main structure is the grand Hall of Prayer for Good Harvest, an impressive architectural feat. Today this park is a favorite gathering spot for local residents, a community center where people of all ages come to relax, exercise and express through song and dance. Joining in on activities is a fun way to interact with everyday Beijingers and is welcomed with warm smiles and open arms. Visit the Lama Temple. It is the largest Buddhist temple of the Yellow-sect in Beijing and has been completely preserved. Built in 1694 as the residence of Count Yin Zhen, the fourth son of the Emperor Kangxi, it was called "the Palace of Count Yong." After Yin Zhen became the Emperor, he continued to use it as an imperial palace for short stays away from the capital. In 1744, it was converted into a lamasery. Yonghegong is the most renowned Tibetan Buddhist temple in China outside Tibet and holds treasures of both the Han and Tibetan cultures. Beijing Noodle Lunch at a local restaurant. Marvel at the important Terracotta Warriors and Horses underground army pits of the 1st Qin Emperor (3rd century BCE, UNESCO site) with your own eyes and understand the magnitude of this portion of the entire mausoleum project. There are thousands of pottery soldiers and each one looks different. Their solemn assignment was to protect the Emperor Qin Shihuangdi in the afterlife. A circle-vision film reenacts the related events of 2300 years ago. Visit the Xian Ceramic and Art Workshop to learn how to make Terra Cotta replica. Chinese lunch at local restaurant including the Noodle-making demonstration. Afternoon visit the ancient Shaanxi Provincial Historical Museum, it is considered one of the birth places of Chinese culture, the capital of thirteen dynasties such as Zhou (1046 BC-256 BC), Han (202 BC-220) and Tang (618-907), and has its own unique history and cultural features. The Shaanxi History Museum in Xian, regarded as “the pearl of ancient dynasties and house of Chinese treasures”, gives a miniature overview of the thousands of years of Chinese history and the splendid ancient cultures of olden times. Dumpling Dinner followed by Tang Dynasty Show. Morning visit the Big Wild Goose Pagoda - regarded by many as a symbol of the city, the pagoda was built in 652 A.D in Tang Dynasty to house the sutras brought back from India by the famous monk Xuan-zang. Visit the Ancient City Wall, built during the 14th century on Tang Dynasty foundations, date to the Ming Dynasty; the walls are the largest and best-preserved ancient fortress in the world. Lunch at local restaurant. Shore excursion to Shibaozhai- Shibaozhai was built in the slope of a steep hill along the Yangtze River in 1750 with 9 stories, then upgraded to 12 stories in 1956. Shibaozhai is extraordinary and unique since it was built leaning to the hill with engraving eaves. What’s most impressive is that it was made of wood, which is so exquisite and unique that it is crowned as one of the “World Eight Unique Constructions”, and it is also among a few ancient wooden buildings remained in China. Today, cruise through the first of the fabled Three Gorges: Qutang Gorge hemmed by towering cliffs. 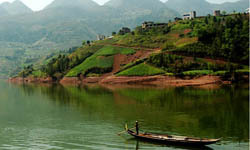 At Wushan, transfer to a cruiser for an excursion up the Shennong Stream with its scenic small gorges. Sail on and pass through Wu Gorge, know for its lofty Twelve Peaks. Next, cruise through Xiling Gorge, the last and most scenic gorge. Finally, pass through the Three Gorges ship lock. At San Dou Ping, see the progress at the historic Three Gorges Dam, the world’s largest hydroelectric project. 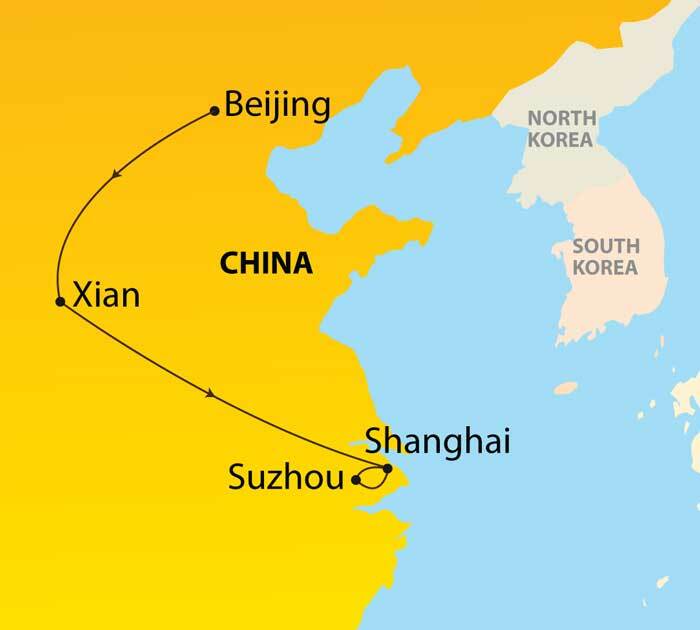 Sail on to Yichang a 8,000-year-old city on Yangtze River，at the entrance of Xilin Gorge. Disembark in Yichang, transfer to airport for flight to Shanghai. Arrive Shanghai, transfer to Sunrise on the Bund (local 5*). Dinner is on your own.